Game theory has all sorts of interesting applications. In their classic textbook from 1991, Drew Fudenberg and Jean Tirole (this year’s Nobel prize winner in economics, by the way) present an example for a War of Attrition from biology. Two animals are fighting for a prize, let’s say food or a mating partner. Fighting, as you might expect, is costly in terms of energy and because of the possible injuries you might suffer. Both animals do not know the strength of the other. Which means, they do not know how long exactly the opponent is able to withstand* (they might have had some sparring sessions though). 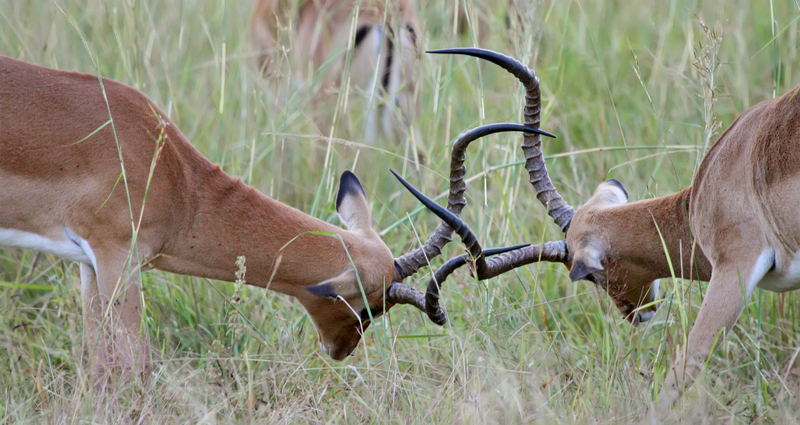 As the fight goes on, both animals become more and more pessimistic about the strength of the other. And because the costs of fighting are accumulating, eventually one of them will drop out, leaving the prize up to the other. Although we occasionally observe fights to the death, these are very rare and most of the times they end with exhaustion and only minor injuries. The goal is winning a fight with the least possible amount of effort. Anything beyond that, risking serious injuries, would be a huge waste of resources, even for the winner. When your enemy appears to be too strong, you rather opt out and try it next year than going all-in.